Three Turner soldiers catch up on the latest news as reported by Frank Leslie's Illustrated Newspaper and Harper's Weekly at the Keokuk reenactment in April 2001. Two new books by Turner member Anita Quick are available for order on October 24, 2012. Civil War Camp Songs is a unique addition to any library, packed with period lyrics and lavishly illustrated with five years’ worth of reenactment and battlefield photography that brings the past to life. The book features a foreword from Bobby Horton, acclaimed music historian, performer, and composer who has scored thirteen of Ken Burns’ documentaries, including The Civil War and Baseball. With notes and photographs by Anita Quick, Civil War reenactor and direct descendent of Andersonville survivor Samuel Marlow, 65th Indiana Infantry, Co. F.; 112 pages, 8 ½" x 11". Available November 2012, suggested retail $20.00. The American Civil War from A to Z is a treasure trove of Civil War facts, arranged as a mini-encyclopedia and illustrated with color photographs of artifacts, battlefields, and Civil War reenactments, where living historians educate the public about the war that divided, then defined the United States of America. A book for all ages, The American Civil War from A to Z is well-researched and includes an extensive bibliography for further reading. Written and illustrated by author/photographer Anita Quick, Civil War reenactor and direct descendent of Andersonville survivor Samuel Marlow, 65th Indiana Infantry, Co. F.; 56 pages, 8 ½" x 11". Available November 2012, suggested retail $15.00. Turner members Knox and Mary Adler, proprietors of Adler’s Dry Goods, have just opened a store in the St. Louis area at 16953 Manchester Road in Wildwood. The store is located one mile east of the intersection of Eatherton Road (Highway 109) and Manchester Road in the area known as Grover. Since most of their Civil War inventory will be with their traveling sutlery at reenactments until late November, these items will not be transferred to the store until Thanksgiving week. They report that right now they have a pretty good selection of kids’ toys, tea sets, knives and some swords. They will feature the same kind of merchandise that they carry in their tent sutlery, but the store will not be limited to merchandise of the Civil War time period. They want to have an “old times” theme and will include items up into the early 1900’s and back to medieval times. For example, they offer some medieval helmets as well as lamps from the early 1900’s. They look forward to your visits when you are in the area. The store’s phone number is (636)273-1009. The Museum of Transportation in St. Louis County, Missouri, recently opened its special exhibit on transportation of the Civil War, "Roads, Rivers & Rails," presenting how these modes of transportation affected the conduct of the war. This is the first special exhibit of its type that the Museum has ever mounted. In thanking those groups and individuals who helped make the exhibit possible, the Museum recognized the Turner Brigade as one of its contributors. Several Turner members assisted Museum curators in acquiring exhibit items, especially at the Swap Meet. Co. G member Bill Baehr wrote several of the text panels in the exhibit and provided some replica items for display. The exhibit is open until the end of 2013. On Saturday, June 23, the sound of live canister fire echoed across a farm field south of New Baden, Illinois. The occasion was an archaeology experiment conducted by Co. G member Bill Baehr for his masters dissertation in Battlefield Archaeology from the University of Glasgow, Scotland. The gun was an original 1864 12-pdr. Napoleon provided by Battery I, 1st Minnesota Light Artillery. Bill’s experiment was to plot the spread of canister shot to provide baseline information for interpreting findings on Civil War battlefields. A number of Turners assisted with conducting the experiment. 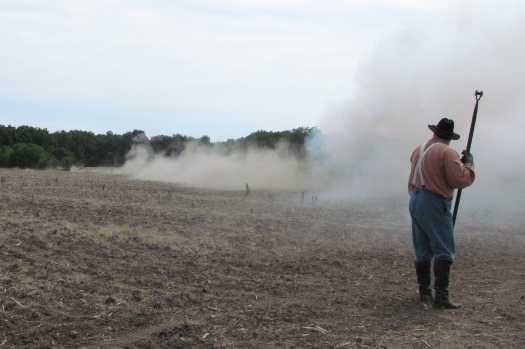 A live canister shot is fired during Bill Baehr's archaeology experiment on June 23, 2012. Seventeen canister rounds, including one double canister, were fired from the gun with the barrel at various known elevations and over various known terrain types on a pre-determined range. The canister rounds were constructed to be as close as possible to the original, and gunpowder used conformed closely to contemporary powder in amounts and explosive force. The range was then surveyed and the shot recovered and recorded using standard archaeological techniques. Computer plotting of GPS-marked positions was used to produce a database of visual patterns. It was supposed that the shot would form an irregular ellipse; however the size and shape of the ellipses were unknown until the results were plotted. Bill Baehr plots the position of the gun muzzle with a GPS before firing. Bill’s team recovered and recorded just over two fifths of the shot (42%) and two thirds of the canister sides, tops, and bases (66%). A crew from Battery I, 1st Minnesota Light Artillery, fire a canister round for the experiment from their original Napoleon. Bill found that canister balls traveled farther than was initially thought and would continue to do damage far beyond the nominal range. This was evidenced by tree limbs in the forest that had been gouged or cut in half by passing shot. He recorded shot as far as 160 yards into the forest (710 yards from the gun); beyond that distance, the search was curtailed because of poison ivy and a lack of time. Bill is convinced shot would have been recovered from deeper in the forest had the search continued. Rob Glenn of Company M, 1st Missouri Light Artillery, watches dust kicked up by canister balls glancing off the hard field after firing. Bill offered the following results that should be of interest to reenactors. Canister spreads to a maximum of about 150 yards across the front of the gun when it is fired (75 yards either side of axis of shot at about 600 yards from the muzzle) and can travel at least 725 yards. At 100 yards, the spread is 11 yards wide, and at 300 yards the spread is over 25 yards wide. Mike Watson prepared a display of recovered canister parts from the experiment for his Ordnance Museum. Since 50 men occupy a frontage of 25 yards (18 inches per man), and there are two ranks in a standard infantry formation, that puts as many as 100 men in the way of a canister shot at 300 yards. On average, nine shot from each canister will strike within the “kill zone” on each 300 yard shot, probably penetrating the first man, and passing to the second. (Canister balls are nearly 1.5 inches in diameter, and have plenty of mass.) This leaves as many as 18 men incapacitated by each canister shot (a potential kill rate of 18%). At 100 yards, seven shot and two pieces of the canister hit within the 11 yard “kill zone.” That means out of 44 men in the ranks exposed, as many as 18 men will be incapacitated (a potential kill rate of 41%). If the artillery switches to double canister, those same 44 men will face 27 balls and four pieces of the canister at 100 yards (a potential kill rate of 140%), and the 100 men at 300 yards will be hit with 33 canister balls (a potential kill rate of 66%). These numbers of course, are widely variable. The listed percentages assume the balls pass through both the front and rear rank soldiers. They might hit one, or the other, or pass through a temporarily empty piece of air. They might also hit file closers, musicians, and officers. Some men will also be hit by more than one projectile, reducing the number of total men hit, especially at close range. Still, this experiment proves without a doubt that closing on a battery loaded with double canister was a very hazardous proposition during the Civil War. Bill expressed his thanks to all the Turner Brigade reenactors who helped make this experiment a success: Steve, Lori, and Reth Allen; Randy Baehr; Richard Black; Nate Corley; Rob Glenn; Skip Korte; Carl, Joe, and Sheila Lockwood; Bob Payton; Gary and Anita Quick; Jason Ratermann; Marty Aubuchon; and Dwayne and Kristina Mueller. NCWAA Chairman Ethan Barnett instructs drill at the school of the piece at Jefferson Barracks. They came from as far away as Wyoming to attend the June 25th School of the Piece at Jefferson Barracks in south St. Louis County, Missouri, co-sponsored by the National Civil War Artillery Association and the Sons of Union Veterans of the Civil War, Sons of Veterans Reserve. The sky threatened rain, but the weather held long enough for 74 artillerists to be instructed on field guns, mountain howitzers, or both. The school was organized by Randy Baehr, Chief Inspector for NCWAA Region XII, and this year's winner of the George MacDonald Award for his outstanding contributions to the NCWAA, and Jack Grothe, Commander, 4th Military District, SVR. Six local instructors were Mike McCubbins, Henry Leady, Charles Tullock and Virginia Wagner of the Turner Brigade's Co. M, 1st Missouri Light Artillery, and Danny Tolka and Larry Stephens of the 1st Illinois Light Artillery, Co. D.
Participants were primarily Union and Confederate reenactors from branches of service that included artillery, infantry, cavalry, engineers, and navy. The day began with 7:30 a.m. registration, then moved indoors for classroom testing and instruction led by Jack Grothe and Virginia Wagner. 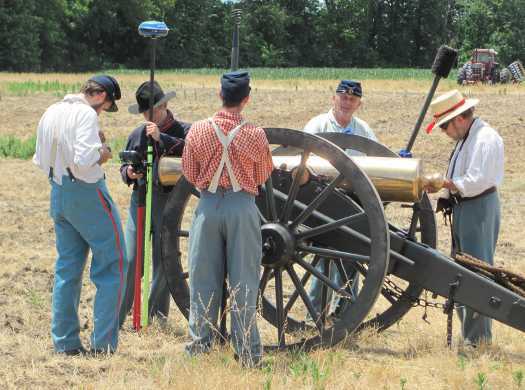 Following the written test, artillerists returned to the field, where NCWAA Chairman Ethan Barnett detailed the responsibilities and safety concerns of each cannon position. Ethan was assisted in his demonstrations by NCWAA Treasurer John Clark. Randy Baehr then issued crew assignments, and training began on seven replica pieces of artillery: two Model 1841 six pounders, owned by Danny Tolka and Ed Bounds; an 1861 Filley gun owned by Randy Baehr; an 1853-1861 Ames 3-pounder, owned by Dave Hagler; an 1861 Woodruff gun, owned by Charles Tullock and Randy Baehr; a Model 1841 12-pounder mountain howitzer, pack carriage, owned by Ken Ess; and a Model 1841 12-pounder mountain howitzer, prairie carriage, owned by Charles Brulle. Lunch was catered by the Ladies' Union Aid Society and was greatly enjoyed by the attendees, whose numbers had increased considerably in two years' time. At the 2009 JB School of the Piece, 59 cards were issued to NCWAA artillerists. This year, 74 cards were issued, thanks to Randy Baehr, Jack Grothe, and a dedicated group of Civil War enthusiasts. NCWAA Chairman Ethan Barnett, right, congratulates Randy Baehr, left, the 2011 NCWAA George MacDonald Award recipient. 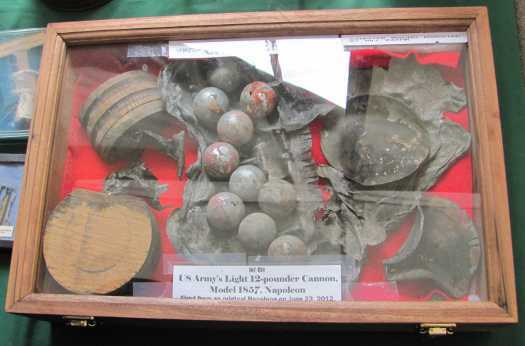 This year's winner of the prestigious George MacDonald Award was announced by National Civil War Artillery Association Chairman Ethan Barnett at the 2011 Jefferson Barracks School of the Piece. The award is named for the man whose vision of an organization of Civil War artillerists, dedicated to high standards of performance and safety, would be the cornerstone of the NCWAA. Although MacDonald died before he saw his dream realized, the award given in his memory is bestowed-usually only one a year-on an individual who is recognized by the association chairman as someone who has made substantial contributions to the hobby, someone who's made a very big difference in spreading safety and in keeping the NCWAA moving forward. For Chairman Barnett, when it came time to make the award, Randy Baehr was really an easy choice. Randy's dynamic personality and organizational skills help make the Jefferson Barracks artillery school one of the best in the country. Randy has been a stalwart supporter of the NCWAA organization for 12 years. He attended his first School of the Piece at Jefferson Barracks in 1999 and afterwards helped organize the schools with Jack Grothe of the Sons of Union Veterans of the Civil War, Sons of Veterans Reserve. Following the 2003 school in Washington, Missouri, Randy was asked to be the Chief Inspector for Region XII (Missouri and Iowa), where the NCWAA did not already have a presence. After being assured it was primarily a paperwork position, he accepted. Randy has accomplished much since his first Civil War event as a spectator, taking a steam train ride in Jackson, Missouri, where rebels fired on the train and the train returned with a gun on a flatcar to attack the Confederate camp. For the past 11 years, Randy has served as editor of the Turner Brigade's newsletter The Shrapnel, and earlier this year was honored by the brigade with an Ames artillery officer's sword and custom leather sheath. The Turner Brigade grew out of Company M, 1st Missouri Light Artillery, which Randy kept seeing at reenactments and events like the Compton Heights Band concerts and the Forest Park Boy Scout camporee. Then, in 1992, the Baehr family went to a living history campout at Jefferson Barracks as modern civilians and emerged as Civil War reenactors. 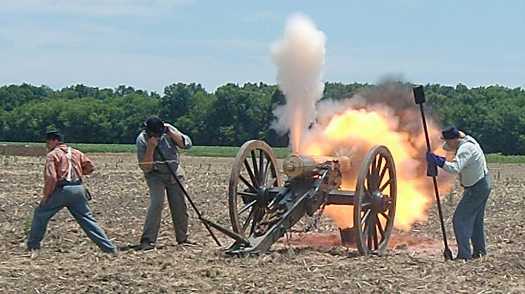 Randy says, "It only took about 3 minutes of standing with a 9-pound musket to convince me that artillery was for me. Besides, they kept telling me it was less expensive. Yeah, until you buy a cannon." 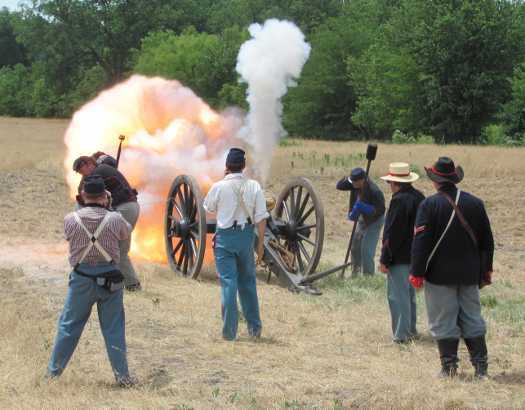 In 1992, Randy joined Co. M. He now serves as Captain and commander of the unit, which fields a battery of a 4-pounder Filley gun, an Ames 3-pounder gun, a Woodruff gun, and a 12-pounder mountain howitzer. He likes the unusual small guns, and finds great reward in talking to the public about the Civil War and artillery. Randy especially enjoys drilling with schoolchildren but adds that it is also very rewarding to train new artillerists and have them be recognized as well trained. Company G member Charles Prather was recently profiled in The Gateway Wing, the unit newsletter of the 932nd Airlift Wing. Charlie also serves as a medical technician with the 932nd Medical Squadron. Click here to view the complete article. Capt. Randy Baehr, center, with his son Bill, left, and wife Pat, right, at the conclusion of the presentation ceremony at the Camp Jackson event. Dave Hagler is at the far right, and Company M is behind them. “Gentlemen, I have a special announcement. There comes a time when a ‘thank you’ is not enough to show someone our gratitude for a job well done. Captain Randel Baehr is just that person. Eleven years ago Randy accepted the post of Editor of the Turner Brigade Newsletter-the ‘new’ Shrapnel. At the time, little did he imagine, when he stepped forward to accept the title of editor, he would be so creative as to be indispensable to the Turners, who now eagerly wait for each issue of The Shrapnel to appear in one’s mailbox. He has kept us informed of historical facts, new faces, upcoming events, what will be available at them, and how to get there. “2011 marks the beginning of the sesquicentennial of the Civil War. We all recognize Captain Baehr waving his well-worn artillery saber, shouting his commands. What better way to show our gratitude than to retire his old sword and replace it with one more appropriate to a man of his stature. Randy has earned the admiration of his fellow Turner Brigade members. May you lead your men proudly through these historic years ahead. “At this time, the entire Turner Brigade wishes to present to you this Ames artillery officer’s sword, along with this hand-tooled, protective leather case. God bless you." The surprise project was well underway at the Swap Meet, with 1st Sgt. Mike Watson collecting funds from Brigade members. Their contributions more than covered the expense of the sword and the leather sheath, custom-made by Mike McCubbins. After Dave Hagler’s remarks, Mike Watson presented Randy with his new sword, Mike McCubbins presented the sheath, and Dave Hagler passed an envelope with ‘a bit of currency for you and any special project.’ Pat Hagler presented Randy with a poster that included his first Shrapnel in its new format, a list of Brigade members at the time, and a list of Brigade members from then who are still with us. Capt. Greg Zelinske then led the brigade in a salute to Capt. Baehr, who returned the salute with his new sword. Over the years, the Turner Brigade has graciously thought of Fort Davidson State Historic Site by giving donations through your memorial program and by other means. Our treasurer has informed me that your gifts just since 2001 are higher than our highest award of at the Gen. Sterling Price level. We normally would not give out a special award, except that the Turner Brigade has repeatedly supported our efforts. Last year we presented the St. Louis Civil War Roundtable with a special Abraham Lincoln certificate for their continued support. Turner Brigade is a similar organization and because of your continued support we proudly give you a special Ulysses S. Grant award. Only your organization will ever be given this honor. Your recent gift of $450 to the Civil War Preservation Trust will go toward saving 1.07 critical acres of land at the Battle of Franklin in Tennessee. Not the largest transaction that you or I have been a part of, but certainly one of the most important. As Jim [Lighthizer, CWPT President] said in his recent letter, the Federal line of defense ran across this property, and it was the site of almost incredible slaughter. Inch by inch, we are - along with our fantastic local partner group Franklin's Charge - working to save as many crucial acres of this important, neglected battlefield that we can, reclaiming hallowed ground that was once considered lost forever. Yet again you have answered the call to help the local heroes on the ground in Tennessee save this battlefield. On behalf of them and all of us here at CWPT, you have my most heartfeld thanks. Greg Zelinske, current Captain of Company G, John Lee, and his son Sam at the Old Courthouse Christmas Ball in December 2008. John Lee, former Captain of Company G, passed away suddenly on March 18, 2009. He is survived by his wife, Monica, and sons Richie, Sam and T.J.
John joined Company M in the second half of 1992. During the period in the early '90's when Company M was growing in numbers, but the gun owners at the time were not always getting the guns to events, John was among those who got muskets to serve as infantry when not needed on the guns. This was the beginning of Company G. By 1996, John was one of Company M's sergeants. In 1997, Company G organized formally with John commanding as Corporal. He was elected First Lieutenant, Commanding, in 1998 through 2000, and then Captain, Commanding, in 2001. Family obligations caused John to reduce his reenacting participation the next year, and he relinquished command of Company G to Dave Burns in 2002. John began participating again occasionally with his son Richie starting with the 2007 Pilot Knob event, and they both were at the 2008 Veterans' Day Parade with the Turners. John Lee was an important part of the growth of the Turner Brigade and Company G in particular. We were looking forward to seeing him in uniform again more often. He will be missed. Turners fire a salute to their former captain after the funeral service. John Lee leads Company G at the 2000 Turner Spring Drill at Jefferson Barracks.